June is the National Myasthenia Awareness Month when Myasthenia Gravis Foundation of America (MFGA) spread information about the condition affecting millions of Americans. Myasthenia Gravis (MG) are Latin and Greek words meaning “grave muscular weakness.” The most common form of MG is known as a chronic autoimmune neuromuscular disorder, which affects voluntary muscle groups causing fluctuating weaknesses. General weakness in legs and arms. Drooping eyelid on either one eyelid or both. Difficulties in chewing and swallowing hard food like steak. Antibodies produced by the immune system blocking or destroying muscles receptor cells. Abnormally large thymus gland especially in children. Myasthenia Gravis cannot be inherited although mothers with a history of the condition may pass it to their newborns, though rarely. But with proper and immediate treatment, children usually recover within two months from birth. Keep off crowds or contact with people suffering from respiratory infections, like cold and flu. Maintain optimal weight and muscle strength. Manage stress and avoid emotional extremes. Notify your physician if you notice medications interfering with your condition. The purpose of Myasthenia Gravis Awareness Month is to inform the general public about the seriousness of MG and raise funds to help people living with the condition. The money raised is used fund researches and develop educational materials and programs. The FGMA conducts several programs and conferences annually with the hope of fulfilling their mission to provide information and support to people with myasthenia gravis through research, education, community programs, and advocacy. According to the Myasthenia Gravis Foundation of America (MGFA), symptoms of MG start to appear between the ages of 20 and 30 in females and between 50 and 60 in males. MG awareness month also targets increasing treatment availability to all people living with the condition across the world. In addition, it aims to make public different forms of MG and their negative effects to the affected people as well as friends, co-workers, family, and others. Use social sites like Facebook and Twitter to spread awareness about Myasthenia Gravis. Engage close friends, relatives and others to attend a Myasthenia gravis screening. Pay a generous visit to people living with the condition. Help in the distribution of poster, flyers and other educational materials to inform the public about MG.
Make donations to organizations supporting the fight against MG.
Come up with a fundraiser for supporting people with Myasthenia Gravis. Contact local radio or television stations to come up with programs about Myasthenia Gravis Awareness Month. Write and publish articles with useful information about MG.
Start counseling or educational center/hotline for people living with Myasthenia Gravis. Create awareness about MG in your workplace, organization, school, or other avenues. Host a conference talk or show about MG and how people can cope with its symptoms. 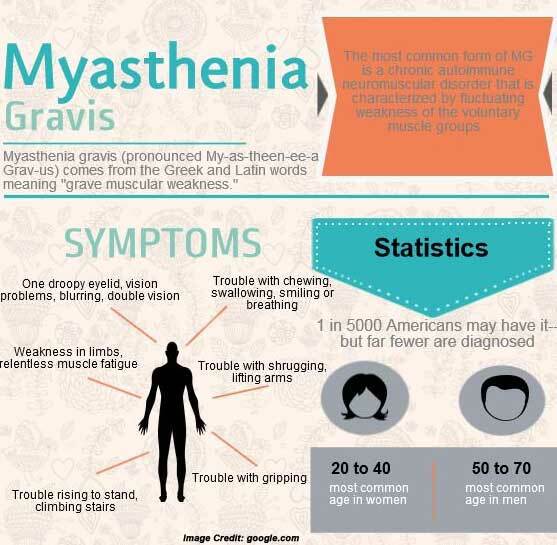 Myasthenia Gravis is a serious health problem many people are not aware of. It causes weaknesses in different muscle groups and can be fatal without special care. 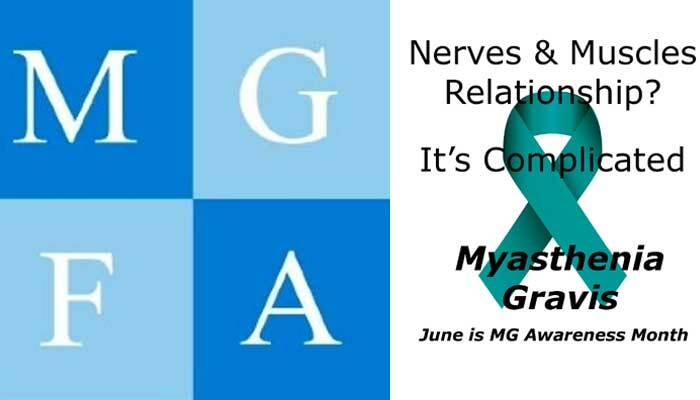 It is during this Myasthenia Gravis Awareness Month that you should take the opportunity to share vital information about MG and give total support to people living with the condition as well as those close to them, such as spouses, co-workers, family, close friends, and neighbors. Your participation in any way to spread awareness about Myasthenia Gravis will go a long way in helping those who are afflicted. Myasthenia Gravis is usually characterized by voluntary muscle weakness. Make donations, arrange events, and use your social networks to create awareness about MG. Beware that irrespective of your age, gender or race, you can suffer from MG. In severe cases, MG can lead to breathing difficulties if diaphragm and chest muscles are affected, prompting the need to use a ventilator until your muscle strength returns after proper treatment. Take every precaution and medication as directed by your doctor to avoid MG crisis, and seek immediate medical intervention if it occurs.